Discussion in 'Defence Analysis' started by Bregs, Apr 14, 2017. India, with its modest, laggardly pace, is far behind. A report of the Indian Parliament’s Standing Committee on Defence, released in 2013-2014, terms the Indian infrastructure along the Sino-Indian border to be in a poor state. Of the 73 all-weather roads along the Sino-Indian border that India had identified for construction in 2006, just 18 have been completed. Of the 27 roads that were to be constructed by the Indo-Tibetan Border Police, only one is complete and at least 11 roads are behind schedule. The Narendra Modi government has allocated approximately Rs 5,850 crore in road contracts for the year 2016-17 for upgradation of nearly 610 kms of road network and basic infrastructure, by 2020, especially along the border in Arunachal Pradesh — a five-fold jump from the two preceding years. A 52-km road stretch is being built in Taksing village, around 550 km from Tawang, to enable the Army to quickly move supplies and troops to the India-China border in case of a conflict. Similarly, there is a push between Tawang and Bumla pass to finish most of the 33-km road stretch that is uncarpeted. “Last year, we could not complete this stretch due to lack of funds. But we hope to receive the funds and will complete the remaining road stretch soon,” said Rajiv Kumar, assistant executive engineer. But it is a long haul to Tawang. The last railway stop is Bhalukpong, 330 km away, while only helicopters can land in the hill town. There are five chopper flights per week from Guwahati, but these are entirely dependent on the weather. On an average, barely one-two flights land in Tawang per week. During rains and winters, the choppers remain grounded for weeks on end. 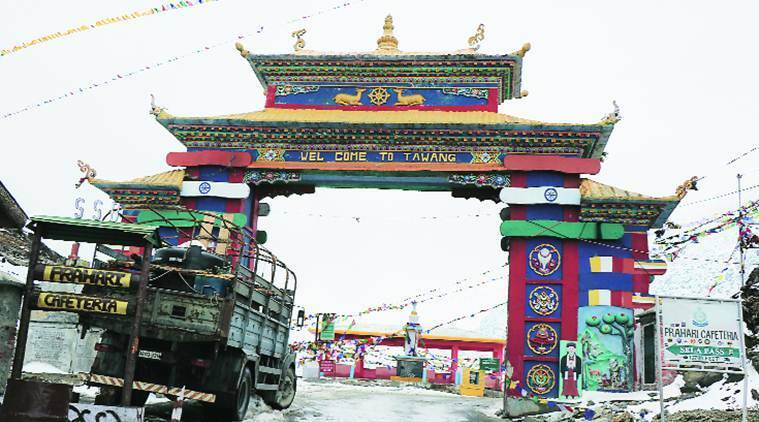 That leaves Tawang’s 49,000-plus population, like it did the Dalai Lama last week, at the mercy of the road network. There are two national highways connecting Tawang to Guwahati via Tezpur in Assam, but the road most used on this stretch is National Highway-27. It is a 19-hour ride, climbing up to nearly 13,700 feet above sea level, traversing snowy passes and past hair-splitting bends. The closest big town is Tezpur, in Assam, 360 km away. Along this route, the 180-km stretch from Bomdila to Tawang is a landslide-prone road. Road-carpeting and widening has been under way at various places for the last two years. “We are also coming up with a bypass on the Jhang-Tawang stretch. Once completed, this would cut travel time by at least two hours from Tezpur to Tawang,” says Rajiv Kumar. As for public transport, one bus leaves Guwahati for Tawang at 6 am and reaches Bomdila in the evening. Passengers halt in Bomdila and the journey is resumed the next morning. It takes another 12 hours to complete this 180-km stretch. Most people prefer private or shared taxis, with Tata Sumos the choice on the Tezpur-Tawang stretch. A convoy of Sumos carrying 10 passengers each depart from Tezpur early morning between 4-5 am. They reach Tawang in the evening by 6-7 pm. Each passenger is charged Rs 750 for the one-way journey. “Because of the landslide prone stretch on the highway between Bhalukpong and Tenga valley, there are army pickets located at regular intervals. Army keeps patrolling the area to help the tourists in case they get stranded,” says Sanjib Shah, a taxi operator in Tawang. The 52-km broad gauge train stretch between Dekargaon in Assam and Bhalukpong in Arunachal Pradesh had taken five years to lay, and was inaugurated by Railways Minister Suresh Prabhu in August 2015. In 2015, the Railway Board also cleared a proposal for the final location survey of a proposed 378-km track from central Assam’s Sonitpur district to Tawang, of which Dekargaon-Bhalukpong would be a part. In February 2017, the district hospital of Tawang was the recipient of the Union government’s Kayakalp award for cleanliness, and received a cash prize of Rs 50 lakh. The money is being used for upgradation of facilities at the hospital. There is one district hospital, two community health centres and six primary health centres across the district. The hospital located in Tawang town has one ophthalmologist, two gynaecologists and one doctor of medicine. To deal with an inflow of around 180-200 daily OPD patients, there are six general duty medical officers. There are no private clinics or ambulance services across the district. An existing 50-bed government hospital was dismantled a few months ago and a 101-bed hospital is being constructed in its place. It is expected to be completed by the end of 2018. Currently, an 18-bed temporary structure is functional as the hospital’s indoor patient facility. The hospital provides X-ray facility and ultrasounds, but for MRIs and CT scans, one has to travel at least 360 km to Tezpur. The hospital doesn’t have an anaesthetist either. Says Dr Narinda Namshum, medical superintendent, Tawang district hospital, “We have no surgeons. In case of a surgery, a patient from Tawang is required to go to either Itanagar or Guwahati, both over 510 km away — a journey that takes 18-20 hours if done without a break.” She adds that at least 60-70 patients every month are referred to hospitals in Tezpur, Guwahati or Itanagar. Not yet connected to the central electricity grid, Tawang depends on domestic power generation to meet its 14 MW demand. Most days, there is either no power or extremely poor voltage electricity, forcing most consumers, including government buildings, to run on generators. In April 2016, the National Green Tribunal suspended the environmental clearance given to the proposed 780 MW hydropower project in Tawang. The NGT’s order also indicated that other hydropower projects in the sensitive border region — part of the transboundary Brahmaputra river basic that straddles China, India and Bangladesh — might have to carry out cumulative impact assessment studies. “Against its requirement of at least 14 MW, Tawang barely generates 2.5-3 MW during winter and around 7-8 MW during summer,” said a senior official of the Electricity Department on condition of anonymity. “We are dependent primarily on three hydropower projects set up on river tributaries. In winters, when the water freezes, generation is minimal. During summers, when the water flow increases in tributaries, our equipment gets damaged,” the official added. He said the government has taken up the matter with the Centre. “Hopefully, within this year, we will be connected with the central grid through neighbouring Assam.” At least 13 hydropower projects, with a total capacity of 2,900 MW, have been proposed for the district. The 780 MW Naymjang Chhu project had run into problems as its barrage was proposed to come up near Zemithang village in Pangchen valley, near the international border with Bhutan and the Tibet Autonomous Region (TAR), and on the nesting site of the endangered black-necked cranes. Tawang residents led by Lobsang Lama (popularly known as Anna Lama since he had shared stage with Anna Hazare in Delhi in 2011 during latter’s anti-corruption movement) had moved the NGT and pleaded that the project would have an adverse impact on the habitat of the endangered species. Earlier too, in 2007, when the state government led by Dorjee Khandu signed number of agreements with private companies for hydropower projects, villagers had formed associations and lodged a strong protest. There are no educational facilities in Tawang after Class XII, and the nearest college is at Bomdila, 180 km away. The closest university, Rajiv Gandhi University, is in capital Itanagar. There are 117 government and 16 private schools functioning in Tawang. The state government runs higher secondary schools, while there is one Kendriya Vidyalaya and another under the Jawaharlal Nehru Scheme. The schools are affiliated to CBSE. While the pass percentage for Class X is around 88 per cent, by Class XII, it drops to near the half-way mark, around 53 per cent. “We hope to have a degree college in Tawang this session,” says Apel Tayeng, Deputy Director School Education (DDSE), Tawang. However, admissions and the faculty recruitment are yet to begin for the college. It was only in August last year that Tawang schools got three subject teachers for the entire district. Block education officer Kharma says they are also worried about poor attendance record of teachers. But in the absence of power to run biometrics, there is not much they can do about it. “We bank on surprise checks,” he says. The Lockean and Grevion like this. The typical Indian mismanagement of decades and the core reason for insurgency in North-East. The 'Imperialistic' mindset can not be rid of!! The 6th Schedule should be scrapped .... a damn waste and abomination in this modern era. Scotlander and Bregs like this. Why the PARAs give less importance to body armour?